An integral part of any Customer Relationship Management (CRM) strategy is offering special discounts to customers or clients that are particularly loyal or important. 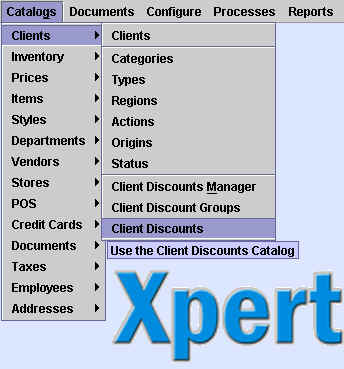 XpertMart™ allows you to set up Client Discount Groups to automatically grant both global discounts (over the entire Invoice) and item discounts (for Items belonging to a certain Department). There are two calatogs you will use to setup Client Discount Groups: The Client Discount Groups Catalog and the Client Discounts Catalog. Futhermore, there is the Client Discounts Manager tool you can use to quickly make bulk changes to these catalogs. This will open up a catalog as shown below. You can create as many Client Discount Groups as you'd like and give them any name. You may want to offer different discounts to VIP customers, to wholesale customers, and so on. If you want these customers to receive a special Global Discount at the point of sale, enter it in the "Global Disc. %" field. Otherwise leave it blank. Later you will need to assign individual customers to a Client Discount Group. The Client Discount Catalog lets you assign Item discounts to all items belonging to a certain Department, for a specific Client Discount Group. The catalog has three fields: a drop-down menu that lets you select a Discount Group (previously defined in the Client Discount Group Catalog), a drop-down menu of Departments, and a Discount field. The percentage you enter in the Discount field is the discount that every item belonging to that department will receive. Create an entry for every combination of Client Discount Groups & Departments you want to create a special discount for. There is no limit to the number of combinations you can create. 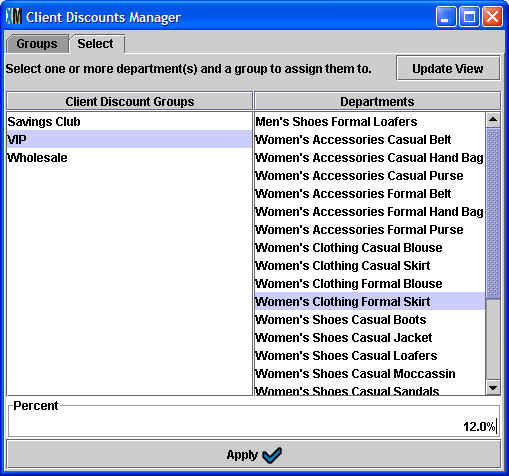 You can use the Client Discounts Manager to quickly create multiple combinations. This will open a tool that is similar to the XpertSecurityManager™ module previously seen in the Security chapter. The Client Discounts Manager window has two tabs: Groups and Select. The Groups tab (shown below) lets you quickly add or edit entries in the Client Discount Groups Catalog discussed above. Click on the <Add group> button to create a new entry in the Client Discount Groups Catalog. Click the <Modify group> button to edit and existing entry. Any change made will appear in the Catalogs>Clients>Client Discount Groups catalog and vice-versa. Every entry in the Client Discount Groups appears on the left side of the screen and every entry in the Departments catalog appears on the right. To enter a new combination, select a Client Discount Group and then select the intended Department. Enter the Item-level discount you want clients belonging to the Client Discount Group to receive. Click <Apply> for the change to take effect. In the example above, all customers belonging to the VIP group will automatically receive a 12% discount on any item purchased belonging to the Women's Clothing Formal Skirt department. Any change made through the Client Discount Manager will be automatically reflected in the Client Discounts catalog. Once you've created Client Discount Groups and created any applicable global and/or item discounts to the groups, the last step is to assign customers to those groups. To do this, open the Client Catalog and find the Discount Group field. 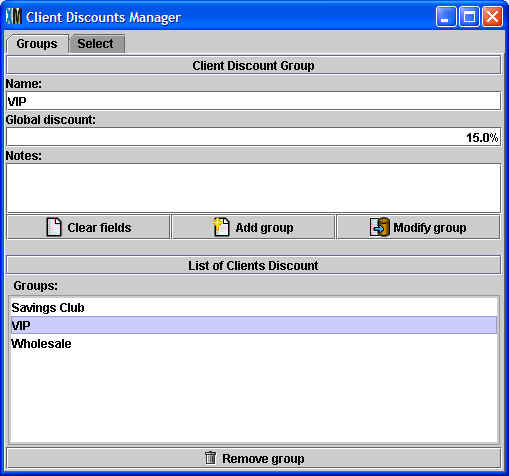 In the field you will see a drop-down menu that contains all of the entries in the Client Discount Groups Catalog. A customer can only belong to one group. If a customer is not eligible for a special discount, you can leave the Discount Group field blank. You can use the Replace By Example feature to assign a large group of clients to the same Discount Group at once. 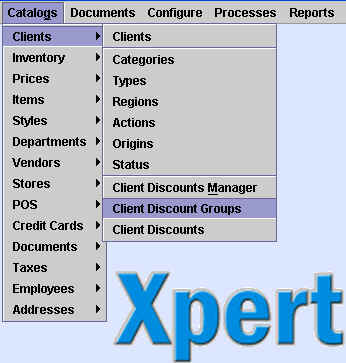 When you ring up an Invoice in XpertMart™ and enter a customer, the system automatically checks if that customer belongs to a Client Discount Group. If the customer does belong to a group, the system then checks to see if there is a Global Discount assigned to that group and enters it into the global discount field in the Invoicing screen. Since the Global Discount is a percent of the total, the new subtotal is automatically updated as items are added or removed from the Invoice. (The user is free to then edit this discount if she has permission to do this). Next, as you add items to the Invoice the system checks to see if those items (as well as and items entered before you entered a customer) belong to a Department that has been assigned an Item Discount in the Client Discounts Catalog. The appropriate discount is added in the item discount field. Once again the user can edit this discount assuming they have permission to do so. The discounts are not mutually exclusive. To use the examples already mentioned, a customer belonging to the VIP Client Discount Group would get a 12% on any formal skirts that are purchased as well as an additional 10% global discount over the total balance on the Invoice. Note that for security reasons if a customer is added to an Invoice and then removed before the transaction is closed out (by pressing <F12>), all discounts on the Invoice are erased and set to zero. This prevents fraudulent use of a certain customer to add discounts to an Invoice without a trace. Since the Client Discount Groups and Client Discounts catalogs are synchronized out to the stores, you can offer special discounts for a limited period of time to certain customers. You can modify the global discount or item discount for a given department and this change will be synchronized to each store. Once the promotional period is over you would once again modify the discount in the appropriate catalog and the change would be sent out in the next synchronization.